As I watch these new chicks getting bigger, I am reminded of how far I have journied with these owls. From a seemingly minor event, my life has taken a number of twists and turns, and led me to where I am today. Four years ago, Allan and I woke up one morning to find an unexpected visitor on our balcony - Pot Plant Owl. That night when we ventured out onto our balcony to admire the view, we found a single owl egg. The following morning, we sought advice from FreeMe Wildlife Rehabilitation Centre's Clinic Manager, Nicci. Nicci told us that PPO had chosen our balcony, our potplant, as her nest. That was it. That's how it started. Although Allan has a bird-watching background, we are not ornithologists by trade. We are just normal, average people who have an extraordinary natural event in our living space. Everything we know about PPO and her family has come from spending many, many hours watching them from our makeshift 'hide' in our bedroom. Through our observations, we've picked up personality types, seen interesting behaviour and recorded beautiful moments. We never intended to write a book on these owls. It happened because people following the story that first year, and asked us to put it in a book to share the story. We're thrilled at the response we have received from our book. Now, we only have 100 books left, and no plans to reprint. Initially, we had no intention of putting a webcam on the balcony for viewers. That is, until we realised what a wonderful educational tool a webcam is, and the positive impact live view sharing has with people from all over the world. The chat room on Ustream that I pop into whenever time allows, is a wonderful place to meet like-minded owl and nature lovers. Where I can, I answer questions based purely on our observations of PPO, Pappa and their family. Another spin-off of PPO's arrival four years ago, is my Public Speaking career taking off in leaps and bounds. Allan and I do many talks to corporates, societies, schools and other institutions about environmental issues, and of course, 'our' owls as well. Saving Pot Plant Owl's wetland is just an extension of this story - of the influence the owls have had on us and our lives. When the wetland development proposal came to light, Allan and I spent hours each day pouring over Environmental Acts, trying to help these owls. 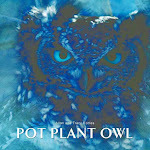 How strange to think that all of the above is part of my life now, because an owl laid an egg in a potplant - our potplant. Yet, as much as I'd love to write more books, chat more on the Ustream site, keep the webcam going for longer - all of these things cost time and money. People joke with me all the time and ask "When you are not playing 'grandmother' to owls, or wearing a 'Save-the-wetland' shirt, what do you do for a real job?" As you can see, I wear many hats - colourful, interesting, exciting hats. And how much time I get to spend wearing each hat, is up to the Universe to decide. All your support is so greatly appreciated - with caring for 'our' wetland, with our book sales, with 'looking after' these owls when we sleep, with hiring us for your Public Speaking engagements, with supporting us in our PPO online store. Tracey, well said. Thank you for sharing your home, time and resident owls with us. And thank you both! For sharing all of this with us! You also have an avid following in the chat room on SPO! It is a great group, and we post lots of pictures. We hope, when you have time, to come and visit us sometime! No, Tracy and Alan... THANK YOU! Tracy, you and Allan are awesome .. Thank you inviting us into your lives to share just a part of that experience; for engaging the public and raising awareness about how special these beautiful creatures are. What can I say more? It's a great job to show and explain a part of the nature for all the world. With your help I can see in Hungary what happens in Johannesbourg. Have a good health to continue!